The big question is how to help create a stable future for Iraq. We're trying to do it with troops. Is that the right way? I examined some of the issues involved in this article for the Canberra Times . . .
A HELPING HAND . . . There are three stories – narratives – to follow if you want to understand Iraq. The first is political: the second, military. We’ll come to the third in a moment. Let’s begin with the politics, the ‘why’ of war. In mid-2006 Nouri al-Malaki emerged from a pack of elected politicians to lead the country. He was US’s choice and for years he proved adept at balancing the chaos; even if he did so by increasingly preferring his own (Shia) majority at the expense of others. Eventually, of course, this policy led to revolt in the Sunni north. ISIL flourished and Iraq divided on sectarian lines. Malaki appeared unable, or perhaps unwilling, to do anything about it. But the US knew the first step to destroying ISIL is proper governance. It withdrew support for al-Malaki. Haider al-Abadi became Prime Minister. It’s still too early to tell if this fiercely independent nationalist and former electrical engineer will be able to reunite the country. He’s from the same party as Malaki. Nevertheless (unlike his predecessor) he’s both moderate and intelligent. Over the weekend al-Abadi sacked 26 generals and commanders for incompetence and graft. This is a necessary prelude to reinvigorating the army. Not long ago the Western media was terrified Baghdad was about to fall. Tony Abbott rushed our troops to the Middle East. But al-Abadi knew the city was safe. ISIL’s forces are swift and terrifying, but also light. They never had the capacity to fight for and hold ground. The Iraqi’s knew this and weren’t going to be bullied by outsiders. That’s why they made our troops wait so long for visas. Now, honour satisfied, al-Abadi will accept assistance. Iraq’s soldiers can’t defeat the rebels by themselves. Or perhaps “won’t” is a better word. After all, who wants to die for a government when you can’t be certain others will fight; if your family will be cared for; or even that victory will follow? Forget the army. It’s hard pushed to defend, let alone attack. Understand one thing: the ‘moderates’ have collapsed. 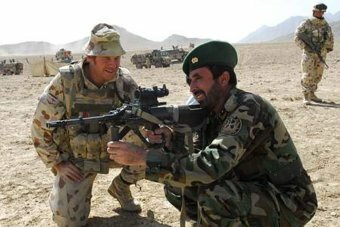 Others, however, are doing the fighting and this is where Australian support will be crucial. Two elements are combating ISIL. The first (and most lethal; to everyone, particularly the ordinary Sunni of the country’s north) is the Iranian-backed Shia militia. The others are the few remaining loyal Iraqi soldiers in the Golden Brigades. These are the black-clad, blue and white scarf-wearing commandos that our soldiers (also commandos, although somewhat more conventionally attired) will be advising. It’s vital for Iraq they succeed. A Kurd leads this unit. Shia and Sunni coexist in the ranks. These two brigades are the last remaining vestige of the idea of Iraq as a ‘nation’. A recent facebook picture of Major General Fadhil Bawari received almost 4,300 ‘likes’. He’s the officer who grabbed a machine-gun and personally led an assault stabilising the front after an ambush. That, of course, is not the job of a commander. He’s meant to be in charge. The trouble is that all the junior leaders with initiative, the people who should be doing the work of corporals, have been killed off. Everyone’s experienced at war – hell, the country’s effectively been continuously at war for the past three decades (since the with Iraq in 1980) – but nobody remaining alive knows how to win. Just watch videos of Golden Brigade soldiers in action. No manoeuvre; just pouring buckets of bullets at ‘targets’. Accuracy’s a seemingly irrelevant consideration. Our commando’s won’t be able to change the way they fight, but they can act as enablers in two ways. The first is by training the reinforcements that the Golden brigade so desperately needs. This will free up the general to command, rather than to lead the charge. The second, and probably the most vital, way in which they can help is by advising. Offering suggestions as to how to employ indirect fire and how to dislodge ISIL positions. Calling in airstrikes. Providing medical and logistic support. But this requires our soldiers to be up at the front, not simply training. Technology is vital here. Last week in Canberra, Northrop Grumman M5 launched an impressive new theatre-level secure communications system (the 400). We’ve got that. But what’s needed to support the small teams we’ll send to Iraq is the smaller system (the 100). This allows individuals to operate effectively. Currently, for example, a team of signallers is required to keep a couple of advisors operating in the field. They require a close protection group. They require transport. Add a medic just in case and pretty soon you’ve added an army of ‘enablers’ simply to allow us to ‘enable’ the Iraqi’s. If our advisors are going to be able to do their job they’ll need to be mobile supermen. These don’t come cheap. Their deployment is going to cost us – not necessarily in lives – but they will need support to get their job done. It needs to be accomplished quickly. ISIL is not strong yet this doesn’t mean it will be easy to defeat. Restoring government in areas of chaos will be problematic. This will particularly be the case if the Iranian-backed militia get their first. This is, to some extent, a race. If the government is too late a new terror may replace ISIL. Oh, and the third story, the one I promised at the beginning of this column? Well, this is the really tragic, terrible yarn, because it’s the story of innocent people and families who’ve been caught up in the spiral of violence and horror. And why? Simply because they happened to be born in a country once ruled by a madman, invaded by America (and Australia) without any plan for what might come next. We are heavily implicated in the origins of the current conflict. Will our contribution solve it?